Somewhere out in the void  about 13.2 billion light-years away, give or take  is a magnificent red blob that was recently discovered by the Hubble Space Telescope. It's a galaxy  or at least it was; it has long since flashed out of existence  but it is far less beautiful or dramatic than nearly any galaxy the Hubble has spotted before. Its magnificence, instead, comes from its age. The newly discovered star cluster  a hundred times smaller than our Milky Way  was formed just 480 million years after the 13.7 billion-year-old universe was born, making it the oldest galaxy ever found. As such, it provides astronomers with a first-time glimpse at the universe in its R&D phase, when small, sloppy galaxies were being formed out of hot gas, only to vanish shortly afterward  leaving the skies free for the huge and mature galactic swirls that would come along later. Reported in this week's edition of Nature, the galaxy  known, unpoetically, as UDFj-39546284  had long escaped the Hubble's gaze, and that's no wonder. Even at its best, the 20-year-old telescope never had the acuity to peer so far into space, where the rapid expansion of the universe causes light waves to shift to a deep red. It was only after Hubble's May 2009 upgrade that its Ultra Deep-Field Infrared imager went online. 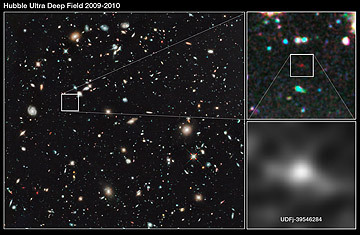 Ultra-deep infrared is exactly what was needed to spot something like UDFj-39546284, but even then, it took about 100 hours of observing time spread across the summers of 2009 and 2010 for the galaxy to be fully visually resolved. When it was, the findings revealed a lot. The galaxy  or mini-galaxy, as NASA is calling it  is thought to have been just 100 million to 200 million years old when its light began the 13.2 billion light-year journey to Hubble's lens. Its size, shape and the era in which it formed all suggest that it began its life as a mass of gas trapped in a pocket of dark matter  a little like a slosh of tea pooling in the depression of a saucer. "We're peering into an era where big changes are afoot," says astronomer and astrophysicist Garth Illingworth of the University of California, Santa Cruz, a co-author of the paper. The changes were big indeed, but they unfolded slowly. In those early days, stars took about 10 times as long to form as they did in later epochs. When they did form, they were typically part of the blue star class  huge, extremely hot stars, heavy on helium, oxygen and nitrogen. Blue stars are fuel gluttons, lasting only a few million years before ending their lives in massive explosions. It would not be long before stabler, faster-forming stars began popping into being in much larger galaxies as the universe rapidly cooled. Between 480 million and 700 million years after the Big Bang  when UDFj-39546284 was still in the skies  star formation accelerated tenfold. It was then when spiral galaxies and the other glorious formations that define the modern universe appeared. Just what forces drove those changes are not certain. Hubble has a lot more stargazing to do before more answers are revealed  and a lot more already-gathered images of thousands of other galaxies to analyze. Better still will be the information that comes from the long-awaited James Webb Space Telescope, the Hubble follow-on, which is slated for launch in 2015. "If we go a little bit further back in time, we're going to see even more dramatic changes," promises Illingworth, "closer to when the first galaxies were just starting to form." Not far beyond that lies the dawn of the cosmos themselves.